There’s no experience quite like spending the night in a castle high on a bluff above one of Europe’s prettiest river valleys. Recent guests of ours had this experience and for some, it was a repeat experience. 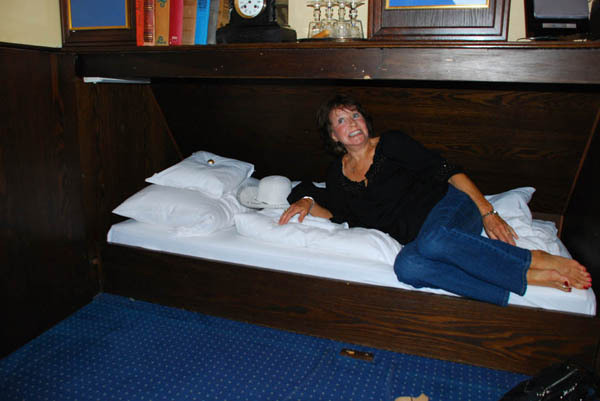 Susan brought son Nick back for a second European Focus Private Tour and this time, four people who had never been to Germany before came along for the adventure. Recent guests on the "drawbridge" to Schonburg Castle. 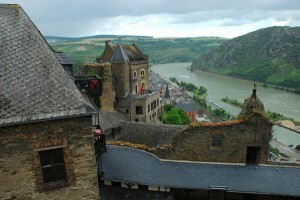 One of Susan and Nick’s favorite places from their 2008 trip was Burg Schonburg above Oberwesel between Bingen and St. Goar. We were able to get rooms last minute at the castle, and the experience was one to remember as rainshowers and rainbows were observed from the crag where this 1,000 year old castle stands proud and strong. It wasn’t always that way. 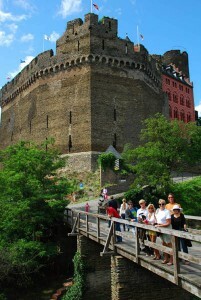 The castle, like many along the river, was destroyed various times in the 17th and 18th centuries. It was rebuilt in the early 20th century by a New Yorker by the name of Rheinlander, who then donated the partially restored castle to the town of Oberwesel. Then in the 1960s and 1970s the castle was transformed into a 4-star hotel with each room and suite completely unique. Antiques fill the many rooms of the castle and a deluxe four-course dinner is served in the evening. For those desiring a true medieval experience, Schonburg is the place! The only way into the inner courtyards of the castle is through this narrow opening, barely wide enough for a golf cart to pass through. 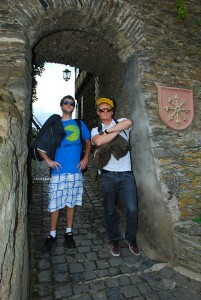 Nick and Trevor get ready to storm the castle. 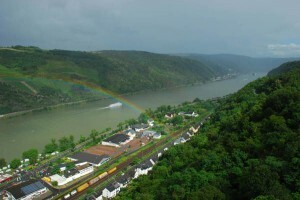 Posted in Cozy Hotels, Germany Tours and tagged burg, castle, europe, family, germany, group, hotel, in, luxury, Oberwesel, of, private, schonburg, small, to, tour, touring, tours, trips.